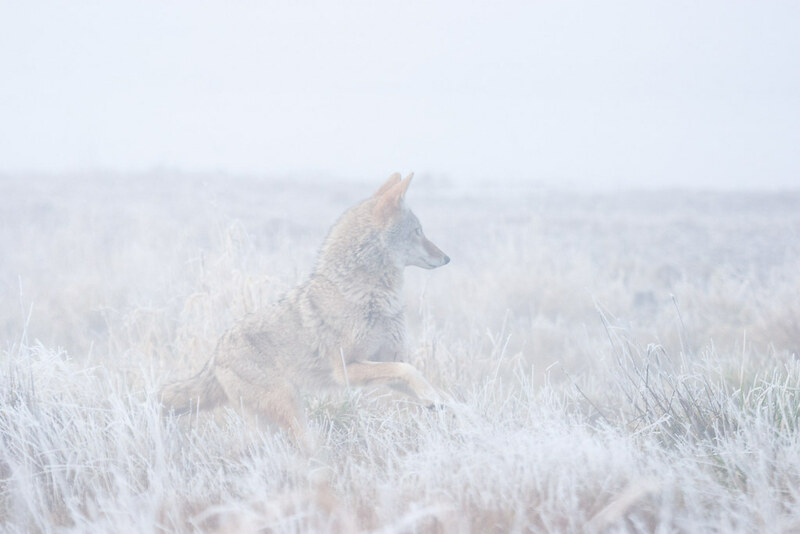 The coyotes were active on this winter day in 2006, using the heavy fog as cover to hunt a variety of prey. This one made a half-hearted, almost playful, attempt at a great blue heron I had been photographing, later I saw one running across the meadow with a goose in its mouth. 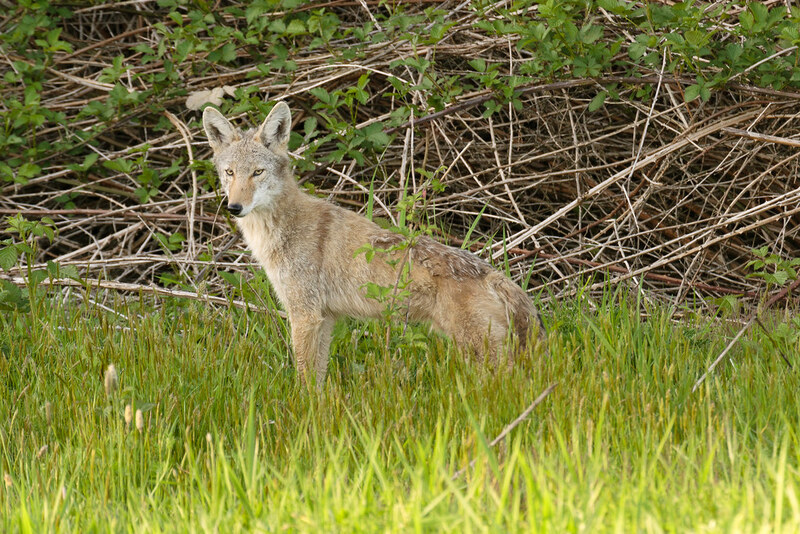 A coyote pauses in the shadow of a dense thicket of blackberries, invasives that are widespread across parts of the Pacific Northwest including Ridgefield National Wildlife Refuge in Washington. The coyote was next to the parking lot at the trailhead for the Kiwa Trail, I got to see and hear it howl in the sunlight before it sauntered up to the blackberries and started down the trail (which was closed to humans, I watched the coyote from my car). 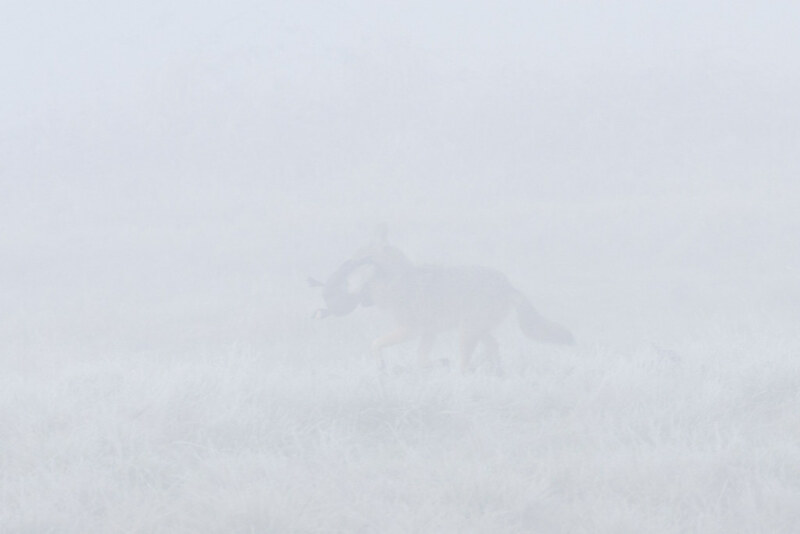 A coyote runs past in a frosty meadow, obscured in heavy fog, with a cackling goose in its mouth. This coyote was hunting along the edge of Rest Lake with another coyote on a winter afternoon. I saw them on multiple occasions, moving about the refuge together, this one had matted fur under its neck and was easy to recognize. Thanks to the auto tour at Ridgefield NWR, I’ve had the chance to watch coyotes up close on many occasions without disturbing them, such as this one hunting for voles on Christmas afternoon in 2011. 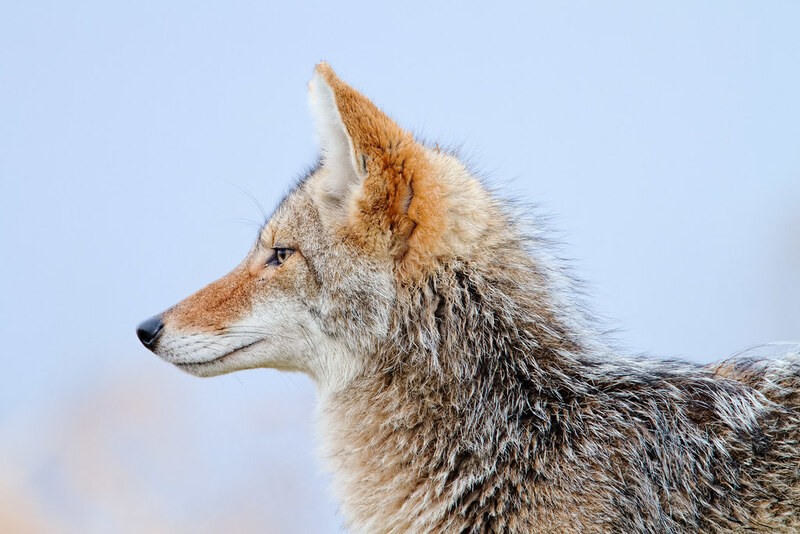 But if it survived into the spring of this year, it’s likely dead now, as the coyotes on the refuge were killed in an attempt to improve the likelihood of Columbian white-tailed fawns surviving into adulthood. The deer are a threatened species while coyotes most certainly are not. Killing coyotes may be necessary to help the whitetails recover, but I’ll miss them, they were one of my favorites. My favorite coyote picture, taken over a year ago in January of 2012. 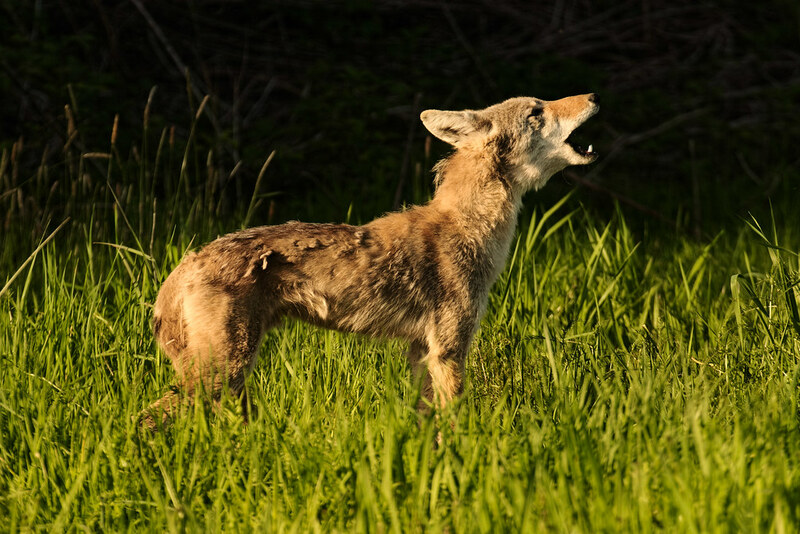 Coyotes have a complicated and controversial relationship with our modern world, and I’m not sure how this pack will fare now that subdivisions have replaced the meadows on the hills above the refuge. I see them near the road sometimes as I drive into town before sunrise, but I see them as roadkill too. And there will be conflicts with barbed-wire fences and dogs and cats. But on this morning, as it hunted for voles with its mate, and as a few snowflakes began to fall, all was peaceful. Only the three of us were around, and since I stayed quiet in my car, they let me watch at my leisure as they worked the length of the dike. A peaceful morning for me, if not for the voles. 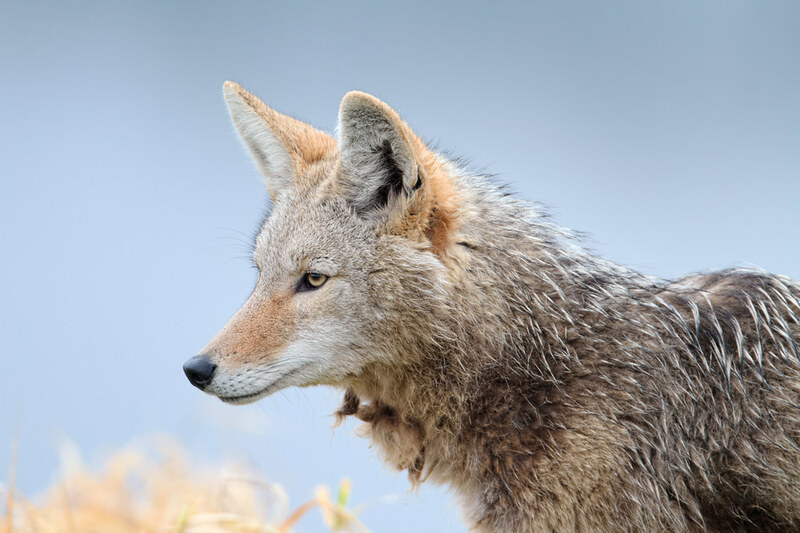 I first met this coyote when we surprised each other on the short trail to the observation blind at Ridgefield. When I got back to the car I moved on to the Kiwa Trail parking lot and discovered the coyote had as well. I drove to the far side of the lot to get a better angle on the sunlight then gently swung the car into place. The coyote didn’t pay me much heed and hunted in the meadow for a while, then surprised me once more by howling a few times (unanswered). It then slipped through the gate and disappeared up the trail. I’ve heard coyotes howl many times but it was fun to finally get to see it.